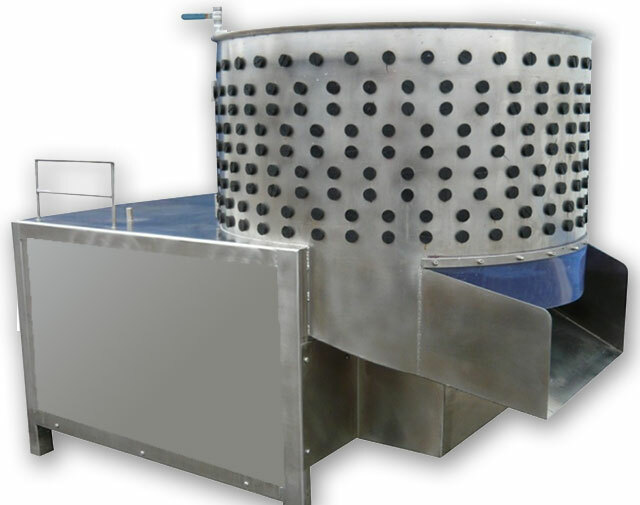 The drum plucker is a machine for picking all types of poultry. The drum diameter is adjusted to the size of picked carcasses. The drum plucker is made of stainless, acid-resistant materials. Appropriate drum size, number of rubber fingers mounted inside the drum and properly adjusted rotational speed ensure perfect quality of picked carcasses. High-quality materials and easy access to these parts of the plucker which are in contact with birds and require frequent cleaning ensure the possibility of keeping the machine clean. Drum pluckers can be used for picking all types of poultry. For smaller carcasses (such as chickens), a plucker with drum diameter of 800mm will be sufficient, whereas for large birds (turkeys), a plucker with 950mm drum diameter should be used. Proper scalding process guarantees the best results of plucking.